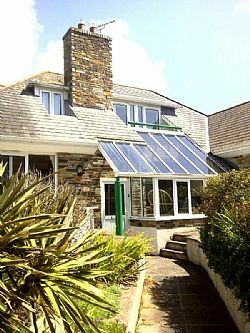 Trehane is a spacious five bedroom house situated minutes walk from Polzeath beach with its vast expanse of sand ideal for surfing and swimming or playing about in the waves. The beach is life guarded during the summer months and theres surf lessons and board hire on the beach. The views of the sea are lovely from the balcony upstairs or sit in the large window on the ground floor and take in the sun. The house is located with National trust land and the coast path to one side and the busy beach, shops, cafes, restaurants and bars to the other side. Pentire Point and the small bays are just a short walk or take a longer walk round to Lundy Bay, Epphaven, Port Quin and keep going to Port Isaac and reward yourself with a pint or cream tea. There are inland paths for the return journey which are much quicker or pick up the taxi at Port Isaac for your return trip. If you walk in the other direction across the beach and take the coast path, through Daymer Bay and along the beach to Rock, then take the ferry over to Padstow, there are some lovely beaches over there or follow the coast path. A ten minute drive is Rock which is a haven for water sports (sailing, water skiing, fishing, rowing), bars, cafes, restaurants and shops. In the other direction is Port Isaac, well known for the Doc Martin series and film Saving Grace. Port Gaverne and Port Quin are both great for coasteering and kayaking which can be booked before you arrive. There’s a wide choice of restaurants, among many others there’s The Dining Room, Rock, Nathan Outlaw in Port Isaac, Rick Stein at Padstow or Jamie Oliver at Newquay to the many character village pubs serving local produce. Trehane is so close to Polzeath beach and also the coast path so there is no need to drive every time you go out of the house. It is light and has a warm friendly feel the minute you walk in. Ground floor bathroom with WC, bath, bidet and basin. First floor bathroom with WC, bath, bidet and basin. As you come in from the beach there is a big walk-in shower and a separate WC. The Property is situated in a rural area where broadband is not as reliable due to overhead lines, please make arrangements for alternative internet access if it is essential while you are away. The lounge has sliding patio doors, comfy sofas, TV and DVD player and a wood-burner. We do not supply milk, bread etc as we find people have very varied preferences. We are very happy to unpack groceries if you arrange a delivery between 10am and 3pm on the day you arrive. Notes on accommodation: The rental is inclusive of electricity and oil fired central heating. Pets may be allowed on request and will be charged £20 per dog. Strictly no smoking inside the house. Outside: There is a small lawn to the rear and a larger lawn at the front of the house with table and chairs. Utility Room: The utility room has a microwave, washing machine and drier, racks for hanging up wetsuits. Cleaning / Towels / Linen / Maid service: Bed linen is included and will be made up ready for your arrival. Other: The dining room has a table and chairs and comfy chairs in front of large windows to the front of the house with views to the sea. 10 of us had a fantastic time! The space was great for everyone to relax and not feel squashed in and it was fantastic to have a dinner table big enough to comfortably get everyone round. The location is lovely, only a short walk down to the beach and easy access to lots of lovely coastal walks. The only improvement I can think of is the kitchen could do with an extra chopping board or 2 as cooking for large groups is difficult without them! Would highly recommend this home! We spent Xmas there with our family and dogs, it was perfect ! The owners have really thought of everything that’s required for a family holiday . The house was great, perfect for our purposes. Idea spot for surfing, walking and general beach activity. Did a bit of fishing too. Polzeath is a lively little beach community with lots of activities. Can't fault anything about it apart from the weather, which wasn't very kind to us. House was easy to find, getting in was all very well organised, clean and tidy. Easily accommodated 11 adults comfortably with plenty of room round the table to all eat together and a great garden. Certainly go again. A clean, bright and comfortable home, strongly recommend. Very well placed property for the beach and walks. Lovely and bright but also warm and snug. Overall a good stay. Starting with the plus points - The house was comfortable, spacious and warm in a fab location. Only a couple of grumbles. Firstly when we arrived we found that the shower didn't work. The pull cord was broken and draped over the radiator. This should of been noticed by the cleaners and corrected before the next guests. We did report this and it was mended the same day. The house sleeps eleven and with one shower, could probably do with another one. Also the dishwasher didn't clean very well, so we ended up washing up - no real hardship for us, but others might mind. Also there was no plug for the kitchen sink, but this was rectified when the shower was mended. We stayed over Christmas and we loved it ! Located a short walk near the beach ! Log burner in the living room making each evening nice and cosy ! Plenty of space in all the rooms and a lovely big dining table for 10 people ! We would definitely recommend to stay here and would return for another stay ! Pentire Point and the small bays are just a short walk or take a longer walk round to Lundy Bay, Epphaven or Port Quin or the other way to Daymer, Rock and Padstow. It is located with National trust land and the coast path to one side and the busy beach, shops, cafes, restaurants and bars to the other side. Please contact owner for booking details and for short breaks. Changeover day flexible except in July and August when the changeover day is Saturday. Arrival time on the Saturday is 3pm, departure 10am.